Rating: 4/5 – A New Host for DC Horror – Lucien the Librarian! If you look at some back issue reviews we’ve written in the past, I have a true love for the horror comics and magazines from the 1970s and 1980s. Although Creepy and Eerie are my favorites of the genre with their amazing lineup of creators, comics like the Witching Hour, House of Mystery or Skywlad’s range of magazines are always must buys when I can find them. Recently during one of Comicconnect’s monthly auctions I picked up the first issue of Tales of Ghost Castle, a series that only lasted for three issues in 1975. This first issue’s creators include Marty Pasko, Paul Levitz, Frank Redondo, Sergio Aragones and more so there’s plenty of quality telling some fun stories! 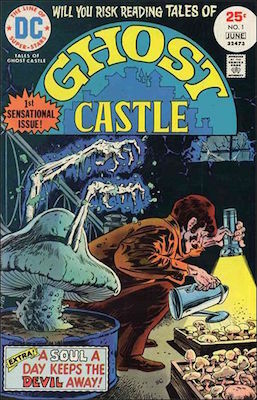 Tales of Ghost Castle also includes the first appearance of Lucien the Librarian, a character who’s mostly known for his appearances in Neil Gaiman’s Sandman. Here we’re introduced to him as the host and narrator of the four stories, which is a staple of horror comics and magazines of the time. Lucien is the caretaker and librarian of a castle in Transylvania where he pores over an extensive library of texts and tomes with his werewolf companion who has the clever name of Rover. The first story that Lucien tells is by far the best of the bunch written by Paul Levitz and titled “A Child’s Garden of Graves”. It’s an adoption story that goes horribly wrong and has an ending that for its time as well for being in a DC comic is quite horrific when you think about it. A problematic young girl is adopted by a family and unfortunately she doesn’t get along with her new siblings. Her gardening skills take a dark turn and set the reader up for a story that can hold its own against DC’s other more popular, and longer running horror series. Although Tales of Ghost Castle didn’t last long, after reading this first issue I’m now on the hunt for the other two to complete the set. As far as I know, Tales of Ghost Castle hasn’t been collected so you’re best bet is to search the back issue bins. I was able to get the first issue in a comicconnect auction graded 9.2 (not slabbed) for $12 which I feel is a pretty fair price. Tales of Ghost Castle may be one of the lesser known DC horror books of the time, but after reading this first issue it’s not because of the content. This entry was posted in DC, DC Comics and tagged comic books, comics, DC Comics, Frank Redondo, Marty Pasko, Paul Levitz, Sergio Aragones, Tales of Ghost Castle, vintage comics. Bookmark the permalink.